In the previous section we went over the various choices you can make when choosing the design of your shovel. Just like a car, ever option on a snow shovel is going to cost you a bit more. The prices can range from $10 to well over $100. In addition to that there are numerous brands that will have similar offerings. This section is to prepare you for the sticker shock that may result when you what your wheeled shovel will be priced at. In addition to that we will go over some brand options. Snow shovel prices range from around $10 for a basic model, all the way up to more than $100 for a shovel with a lifetime warranty. If you shop out of season, such as in spring after snows have melted, you can find discounts and clearance prices, which can save you quite a bit on the purchase of a new snow shovel. Also, expect to pay more for shovels with lengthy warranties and higher quality construction. Ames: Ames True Temper is one of the largest hand tool manufacturers in the world, and it all started in a small Vermont shop in 1808. Griffon Corporation, a company based out of New York, NY, owns Ames True Temper after a merger in 2010. Dart: Based in Passaic County, NJ, Dart was founded in 1993 to distribute rock salt. Dart has grown considerably since then, and now produces a large line of snow removal brushes and shovels. EraPro: EraPro was founded in 1976 and is a leader today in plastic winter products manufacturing. Located in Quebec, Canada, EraPro produces snow toys such as sleds in addition to their lineup of snow shovels. Garant: A leader in snow removal and garden tools, Garant began as a small family business in 1895. This Quebec, Canada company offers a wide variety of hand and garden tools such as rakes, axes and wheelbarrows, as well as steel, plastic and aluminum snow shovels. Suncast: Suncast, a Batavia, IL company, is a leading manufacturer of snow shovels made in the USA. Founded in 1984, Suncast offers a wide variety of outdoor products, including storage sheds, hose reels, pet carriers and of course, quality snow shovels. If you live in a place where it snows, any big box retail hardware store (Lowes, Home Depot, Menards, etc) will have snow shovels year round. Places like Kmart, Target or your local hardware store will carry them seasonally. The only issues with these places will be the choices that are available. Stores will usually only have 2 or 3 choices, and they can sell out quickly when a storm hits. Also if you live in a place where it does not snow, and you will be driving to somewhere it does, you may want to be prepared by ordering a folding shovel for your car in advance. If you find your selections are limited in your local stores, try shopping for snow shovels online. 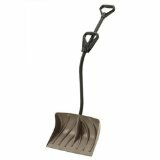 Amazon.com carries more than 200 snow shovels, in a huge variety of styles, materials and prices. 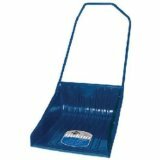 Whether you are looking for a basic plastic shovel or a fancy wheeled shovel, there is a wide selection available. Amazon’s unique rating system makes it a great place to research any major purchase because you can find out exactly what other users think of any given item. Because snow shovels are bulky, make sure to look for shovels that ship for free, which is currently about half of the shovels available. Also you may not have to pay sales tax on the online purchase which could save even more money. They only downside is that you will need to plan ahead since the delivery can take 3-5 days. 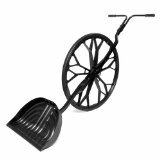 The Snow Wolf: The Snow Wolf wheeled shovel or Wovel, for instance, sells for $129.95 and has a nearly perfect 4.5 star average rating. This thing sounds like it is built to last and has parts that can be easily replaced. It seems a bit expensive, but if it lasts a lifetime and prevents you from having to buy a snow blower, it seems like it makes sense. I have never seen one of these at a local store, but the blizzard we got last year makes we wonder if it would make sense to keep this on hand. I would really like to try one of these out and see what all the fuss is about. It looks pretty neat. This is another unique shovel that has 2 grips for easier lifting of the snow. It also has an s-shaped curved ergonomic handle for easing pressure on the back. It is $33.58 and includes free shipping. I am not sure if I am man enough to handle this shovel, but it looks like it could clear an average size driveway in just a few minutes. I have never seen one of these at my local hardware store and I go way too often. This bad boy is about $80 and gets rave reviews. I am not sure if it is for all conditions though.